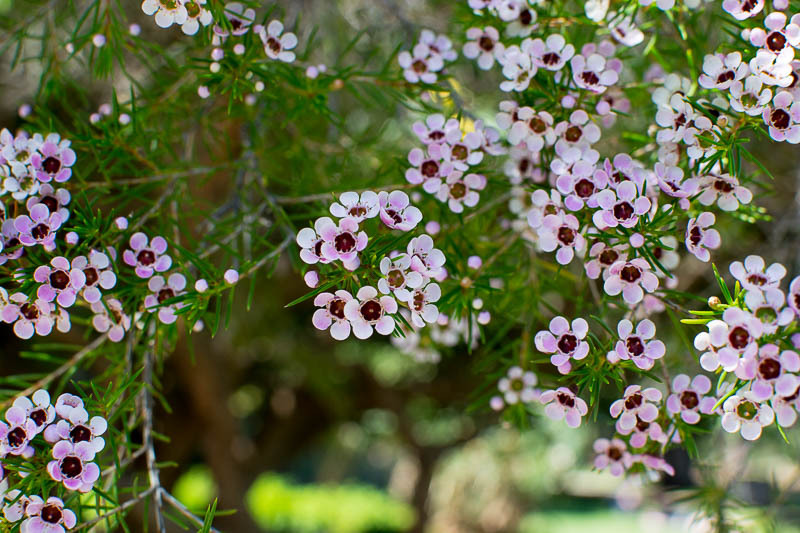 Waxflower is a flowering shrub or small tree originating in Western Australia, its natural range extending along the coastal strip from Perth to Kalbarri, which lies just north of the town of Geraldton. 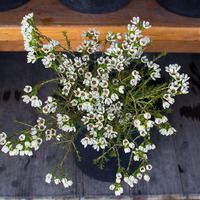 Nowadays, it is introduced in other parts of Australia, as well as in California, Arizona, Israel and South Africa, where it is cultivated both as an ornamental and for its flowering stems, which are used in floral arrangements. 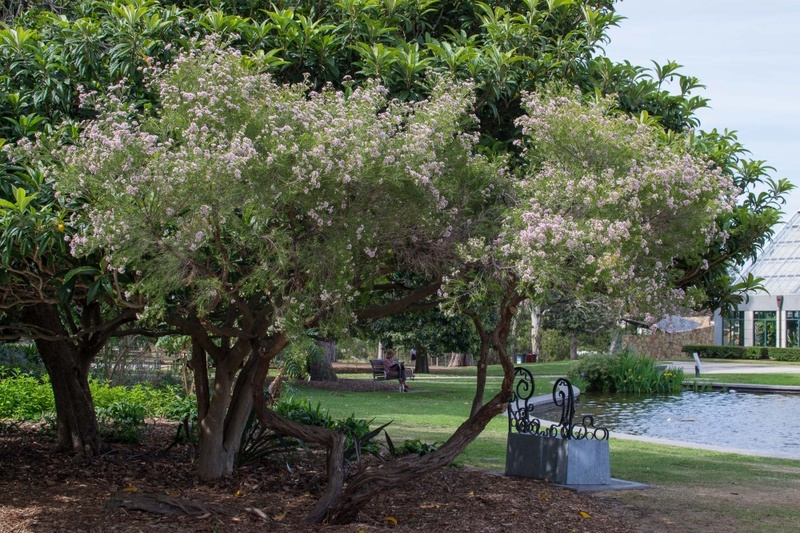 It is typically a shrub to small tree 1 to 3 m (3 to 10 ft) tall with a much-branched, wide-spreading crown, sometimes as wide as the plant is tall. The foliage is made up of dark green needle-like leaves arranged on wispy, woody stems. 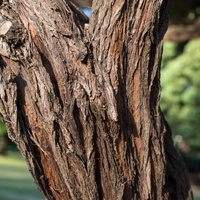 In tree form, the trunk is slender, often leaning, and the bark grey and fibrous. 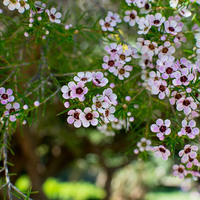 The flowers are small with five waxy petals and as a result of selective cross-breeding come in white, pink and purple varieties. 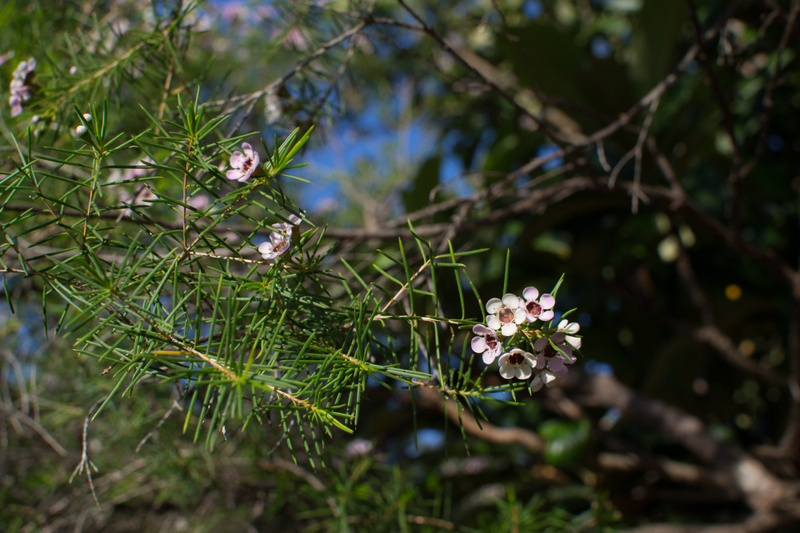 They bloom from winter to spring, in showy clusters at the ends of the branches and are followed by small woody seed capsules containing light brown clove-shaped seed. 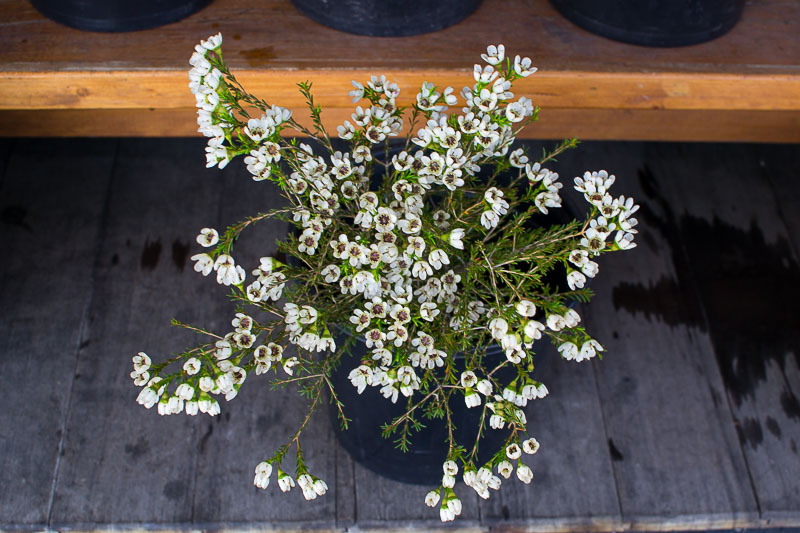 Waxflower is Australia’s best-selling native flower for floral arrangements, both domestically and internationally, with exports of the flowering stems going mostly to Europe, the United States and Japan. They are commonly used as a filler in floral arrangements, mainly as backing for single stemmed flowers such as roses, and are long-lasting, with a vase life of seven to ten days. 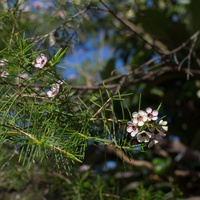 The flowering stems are cut from the plant when the flower buds are fully developed but not yet open. If being shipped, the stems need to be stored at between 1 and 4 °C. On vasing, leaves that would be submerged should be stripped from the stems and the stems stood in water without a preservative added. 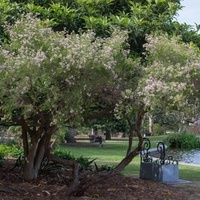 Although naturally adapted to Mediterranean climates with dry summers, it will grow and flower well in dry to moderately humid subtropical climates, generally in frost-free areas with annual lows of 9 to 17 °C, annual highs of 20 to 33 °C, annual rainfall of 400 to 1200 mm and a dry season of 3 to 7 months, extending to 12 months with irrigation. New plants are usually started from cuttings as the seed have low viability. 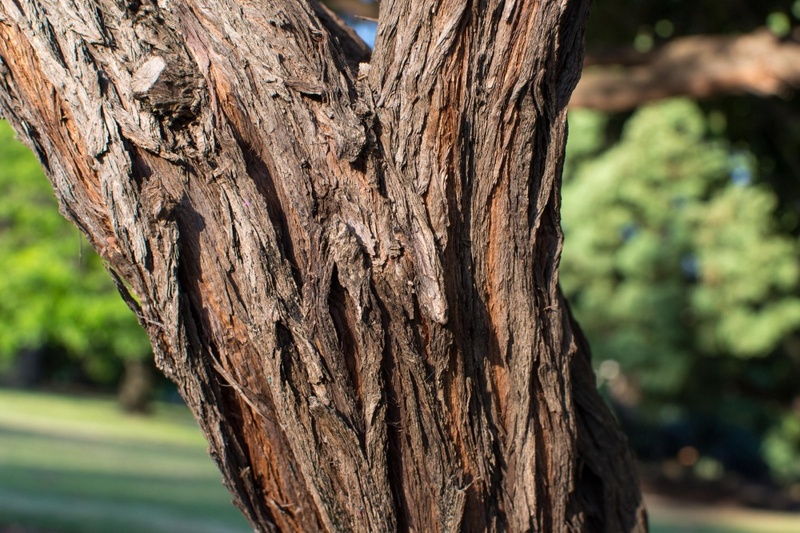 Good results have been obtained with semi-hardwood, side-shoot cuttings set in a gritty, inert potting mix such as perlite. Treating the cut end with fungicide and a rooting compound can improve results. A deep container is needed to give the long taproot room to grow and not become root-bound. Performs best on free-draining sand and sandy-loam soils of a slightly acid to moderately alkaline nature, generally with a pH of 6 to 8 and on sites with full to partial sun exposure. It has poor tolerance to clay or slow-draining soils, and soils of a strongly acid nature. Over-fertilising prior to flowering will result in luxurious foliage and few flowers. The seed have low viability, which lowers the risk of the plant escaping cultivation and becoming a problem weed. It is assessed as a low weed risk species for Hawaii by the Hawaii Pacific Weed Risk Assessment project (HPWRA). The roots are moderately invasive and a minimum planting distance of 2 m (6.5 ft) away from any underground pipes or structures is recommended.